Situated within an elegant mansion block this fabulous 1 bedroom flat offers modern, bright interiors with generous living space throughout. The property is enviably located moments from Regent's Park and the wealth of shops, cafes, bars and restaurants found around Great Portland Street, Charlotte Street and Marylebone High Street. Quick and tasty Pan Asian food just off Oxford Street. After a busy day down Oxford Street, nothing beats a quiet escape to this hidden gem tucked in the heart of Marylebone. 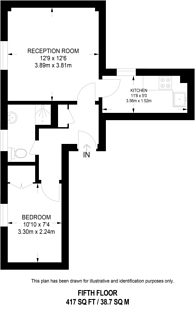 417 (38 Sq M) approx. We have over 1,000 property market reports for locations across London and Surrey - including W1 and Marylebone.